The Weisses Bräuhaus is located east of central Munich in the city district Berg am Laim. Many people of the neighbourhood know of the Weisses Bräuhaus as a restaurant with served terrace. 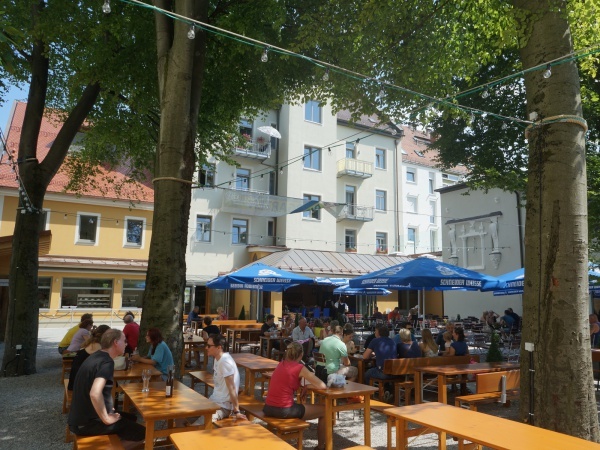 But after a complete renovation of restaurant, kitchen and beer garden, the Weisses Bräuhaus reopened in spring 2015 and now also offers its guests in addition to a served terrace a beer garden section with self-service, where according to Bavarian tradition guests are allowed to bring their own brotzeit. The history of the Weisses Bräuhaus dates back to 1903. In those days Karl Vogl built a residential house with restaurant, brewery building, beer halls, coach house, garden and stable. But already soon after he offered everything for sale and the wheat beer brewery Schneider & Sohn obtained this brewery in 1912. Shortly after the purchase the brewery was closed down and the restaurant was given into the hands of a leaseholder. Since 2015, the brewery manages the restaurant and beer garden by themselves. The regular Hell (lager) comes from Tegernseer and a Maß costs 7.10€ (July 2015). The food stall offers warm and cold beer garden meals, such as Hendl (grilled chicken), Schweinshaxe (roasted pork knuckle), spare ribs, sausages, Wurstsalat (sausage salad), homemade Obatzda (Bavarian cheese spread), green salad and potato salad. This page was last modified on 18 May 2018, at 18:52.